A small cache and dash by the beautiful Roydon village sign. Come in spring and enjoy Mister Colin’s daffodils near the sign! Roydon takes its name from Rye or Rie, which is the origin of Rysing as pronounced in Saxon times.Don or Dun is derived from the Saxon word for hill. Ryedun in times past was part of Rysing. Ryedun stands higher on sandy soil than Rysing hence the the Dun (sandune). In later years the seaport town of Rysing had built its Norman Castle. Over time,this became known as Castle Rising, and Ryedun became Roydon as it is known today. In 1066 William the Conquerer took Ryedun from Stigund, Archbishop of Canterbury and gave it to his brother Odo who was Bishop of Baieux in France. The Church of All Saints, is a small Edifice built in the late 13th Century consisting of Chancel, Nave, South Porch and Embattled Western Tower which contained one bell. There are four stained glass windows, one at the west end in the tower and three in the Chancel at the east end. Roydon used to have a railway pass through and small station (the site is now commercial premises). Sadly, this was a victim of Dr Beeching’s bloodthirsty and merciless purge of branch lines. The course of the old railway line is now a path through Roydon Common. The Common is a great place for nature lovers. It contains numerous species including adders, slow worms, grass snakes, natterjack toads, turtle dove and woodlark, rare spiders, moths and dragonflies. 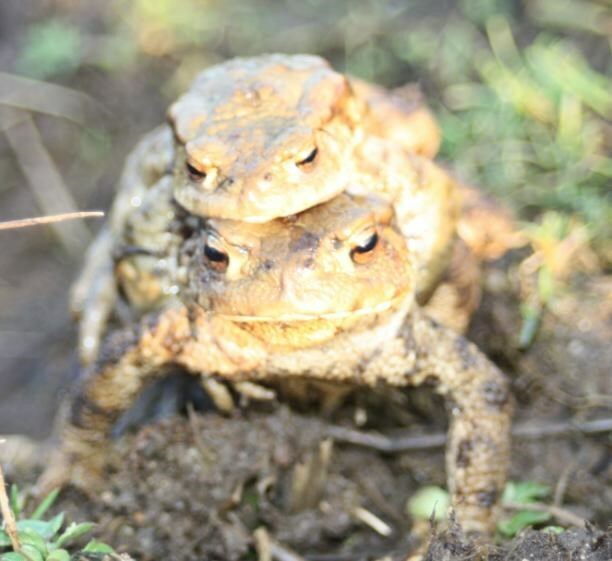 In spring, the village throbs at night as thousands of croaking toads and frogs gather to begin procreation! There is a makeshift layby just round the corner at the entrance to All Saints’ Church on Church Lane, just round the corner from the sign.